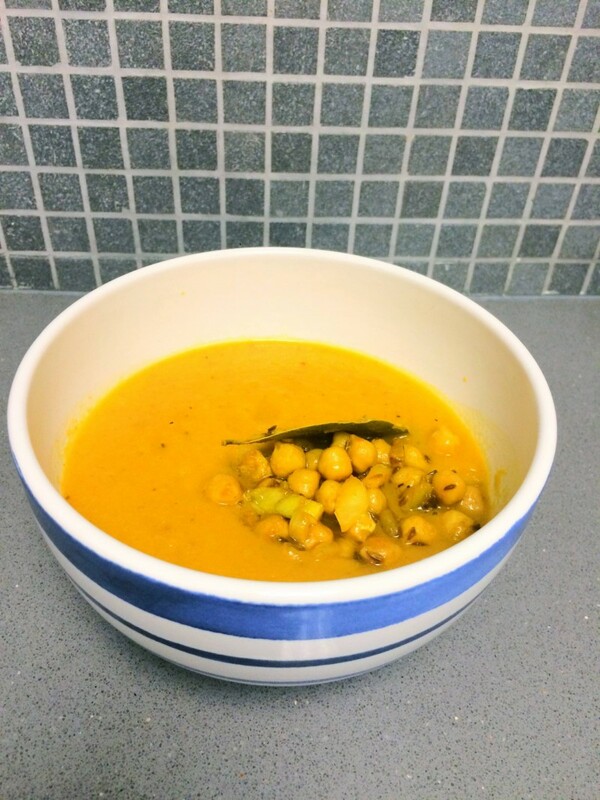 This weekend recipe is a spicy carrot soup with chickpeas. My boyfriend, Adam loves this soup. It’s so easy to make that he can even make it and he is pretty new in the kitchen. It is very healthy, carrots are a great source of antioxidants, they have vitamin C, beta-carotene and many other phytonutrient antioxidants. Carrots benefit the cardiovascular system, it helps oxygenate the blood and arteries. They are also great for eye health, carotenoids. Carrots help fight against eye diseases like glaucoma, and cataracts. Cumin helps in aiding digestion, has essential minerals that we need like magnesium which help with heart health and blood pressure because cumin helps in the absorption of calcium. Cumin is also an excellent source of iron. Coriander helps with controlling cholesterol levels, blood pressure, and is an antiseptic so it’s great for mouth ulcers. If you have anemia coriander is a great source of iron which also helps promote healthy bones. It is also an anti-histamine so if you suffer from hay fever it would be a great spice to add to your food. Turmeric is an antioxidant and helps fight against free radicals. Turmeric also helps improve brain function, fights against depression, and can improve memory. Turmeric also lowers your risk of heart disease, it helps the lining of blood vessels which regulate blood pressure, and clotting. It also helps with anti-aging, which we all want. Chickpeas are a great source of protein, and fiber. If you are trying to lose weight adding chickpeas to your diet will help you feel fuller longer. Also the chili in the soup is great to boost your metabolism in high gear! If you get dried chickpeas soak them overnight. Also, dried chickpeas take longer to cook then the ones in the can. We used dried chickpeas. If you are using dried chickpeas you need to boil them first until tender. After you boil them you can move to the next step. If you are using can chickpeas, drain and rinse them then proceed to the next step. Heat the pan with medium heat with olive oil. Then add the garlic and chickpeas, add the spices and cook for about 10 mins. Heat the olive oil in large pot over medium heat. Add the carrots, garlic, coriander, cumin, onion, bay leaf, 1 teaspoon salt, and pepper flakes, and sauté, stirring occasionally, until they begin to brown, about 10 minutes. Add the vegetable stock (you can also use chicken broth), bring to a boil, and then reduce to heat to maintain a simmer. Simmer for about 30 minutes, or until the carrots are fork-tender. Meanwhile, whisk together the tahini, lemon juice, water, and a pinch of salt in a small bowl till smooth. Set aside. Remove the bay leaf before blending. Then blend the soup until smooth, using a blender we noticed it’s easier to blend if you do it in batches. Season the soup to taste with olive oil, salt, and black pepper. Ladle the soup into bowls, and garnish each bowl with a dollop of the lemon-tahini mixture, a pinch of dukkah, za’atar, and roasted chickpeas. benefits of carrots, best carrot soup recipe, carrot soup recipe, chickpea recipe, foods for anti-aging, foods for healthy hair, foods for healthy skin, natural anti depressant.